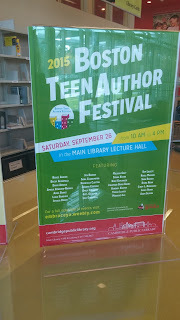 So Right after Mackenzi Lee's Launch party, the Cambridge Public Library had their full Boston Teen Author Festival! 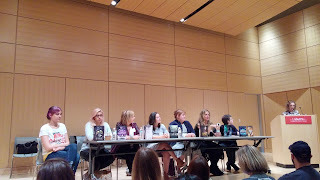 It was a huge event, and I wasn't surprised with the line up of amazing Authors including: Becky Albertalli, David Arnold, Jen Brooks, Sona Charaipotra, Dhonielle Clayton, Lori Goldstein, Trisha Leaver, Adam Silvera, Renee Ahdieh, Zoraida Cordova, Kody Keplinger, Mackenzi Lee, Kekla Magoon, Diana Renn, Cindy L. Rodriguez, Amelia Atwater-Rhodes, Leigh Bardugo, A.C. Gaughen, Melissa Grey, Kendall Kulper, Kim Liggett, Sara Raasch, Anna Banks, Jessica Brody, Emily Franklin, Stasia Kehoe, Jonathan David Kranz, Lance Rubin. Isn't that a crazy awesome list?! I was especially excited about Renne Ahdieh, and Sara Raasch since they don't come by this way much. 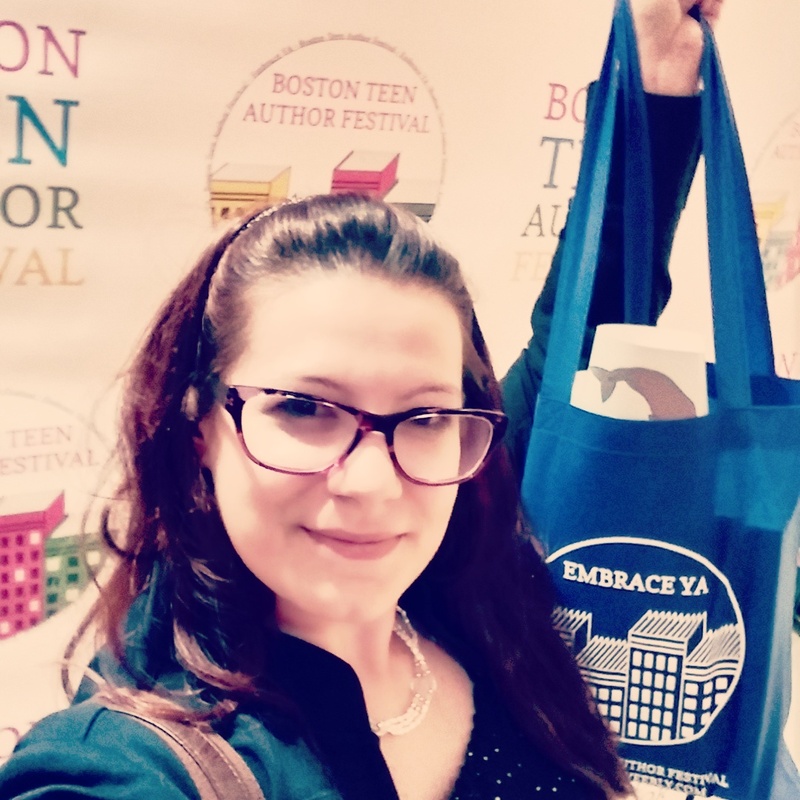 The doors opened at 10:00 and I was running a bit late, but still got there with Lauren B in time for the Meet the authors Panel. The authors were so funny, introducing themselves and giving an odd fact about themselves. Anna Banks had me cracking up, when she said her odd fact was that her leg hair grows so fast, she'd probably have a five'o'clock shadow soon. I've seen Anna Banks on tour before, and she is always so funny and witty. 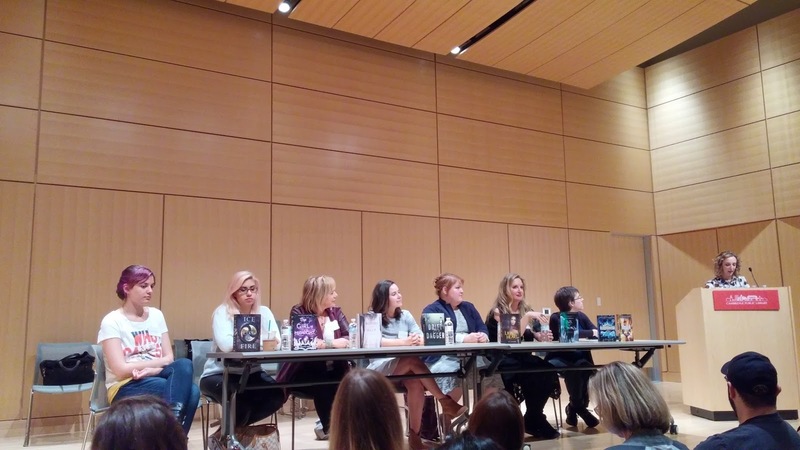 Especially when Paired up with Leigh Bardugo. We met up with Molly and Melissa in between the panels and they said the "Inspired by" panel was getting really full, so we headed there. 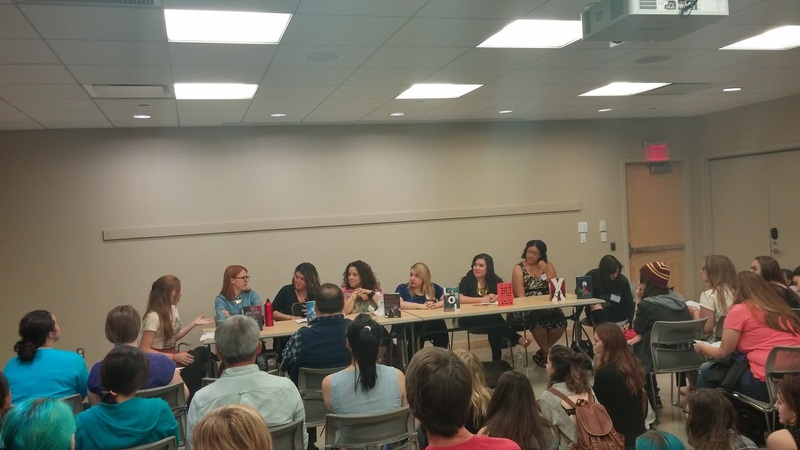 It turns out that the Panel B room is incredibly small, and when we got in there, there was nothing but standing room. So lauren and I decided to split up. I stayed in the "Inspired By..." Panel, and she went to the "Author friendships and crit groups." You can see that there are people sitting on the floor in the middle too. 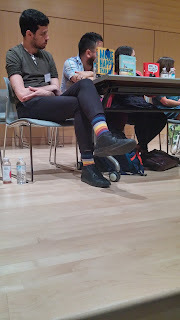 After a few minutes, my legs got tired and I decided to jump to Panel A for the "Author Friendships and crit groups." But before that, I bought a few books, including ICE LIKE FIRE! Porter Square books had it out early! It was so great. They also had a Six of Crows Preorder deal going on too. Adam was killing the questions people had, and was rocking some sweet rainbow socks. But then when we got back and found a nice grassy tuft to eat on. 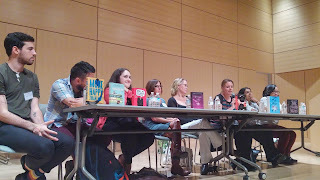 And a while later, those same authors sat right across the way from us. We played it cool though. Then it was back to the panels! The next panel we went to was "The craft". The authors were so funny, playing off each other and making jokes about like their Magic Soft or Hard hahaha How they write their magic systems and where they get the inspiration for it as well. They also covered the hardest part of coming up wither thier magical rules, especially when writing a second book in the same world. After the panel, the signing lines began. Dun dun duuun. 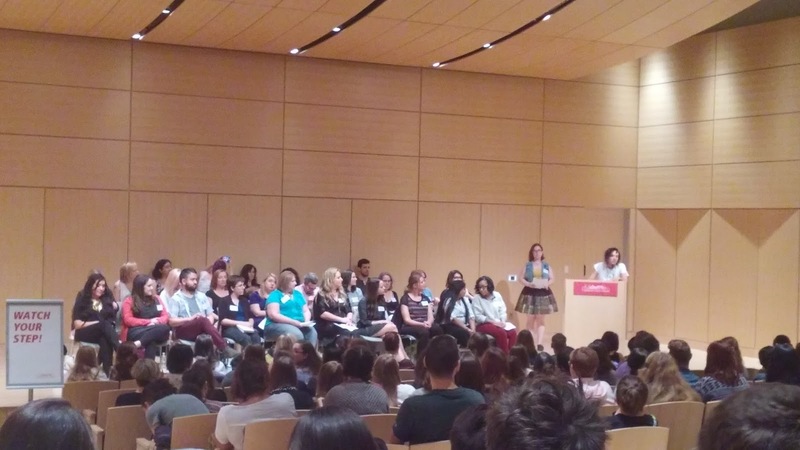 And Leigh Bardugo's line was seriously no joke though. I was lucky that I already had her books signed except Ruin and Rising. So I went over to get Ice like Fire and Drift and Dagger signed, then went outside into the hall to get The Wrath and the Dawn Signed. It was crazy crowded and busy, and I had a birthday thing o go to right after, so I made my way out to wait for my ride with Lauren. But since my ride was running late, we got some starbucks and waited in front of the library,where we met up with Melody again. We had split up during the crazy signings. It was such a fun time. 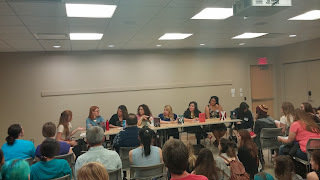 I loved meeting the authors and other writers/ bloggers, and people I've met on twitter. I hope Boston has more tours and events :) I wish I took more pictures, but it was such a whirlwind, I didn't even think of it!